If you have moved and forgot to update your address, you will need to go to your old place of residence and request your green card from the person living at your previous place of residence. It is a crime to steal a green card. On one occasion, a client’s green card was delivered to an old address. The new tenant tore up the envelope with the green card in it, misplaced it, and brought it more than 2 months later. If your card was undeliverable, for example, because the name on the mail box did not have your name, you must call USCIS customer service, and verify the address they have on file and ask them to resend the green card to your current address. If you have not moved and USPS claims to have delivered your green card to your mail box, you can schedule an Infopass appointment at the USCIS Field office where you were interviewed or which has jurisdiction over your place of residence. 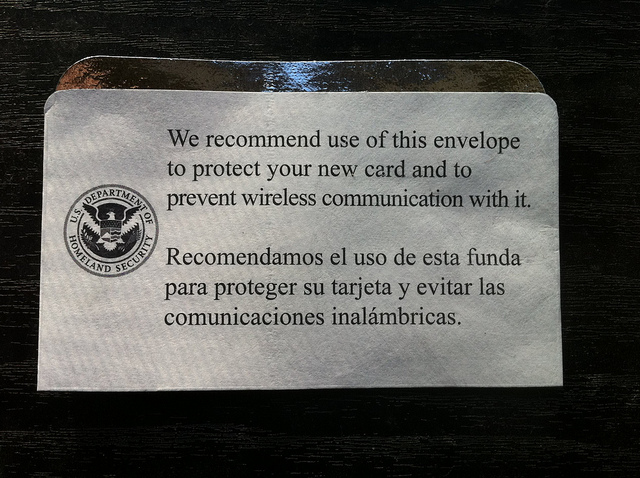 At the Field Office, they will be able to confirm what happened to your green card. Maybe your green card was delivered to an old address and the new tenant mailed it back to USCIS. In this case, USCIS would have a record of that. If you did not receive your green card, but both USCIS and USPS confirm that the card was delivered and not returned, then you must apply for a new green card. The correct USCIS form to request the green card in that case is Form I-90. As of December 2014, the fee for the I-90 is $450. The I-90 can be filed online or by mail. If you do not have any urgent need to travel, file the I-90 paper version. Then, you will be able to file the I-912 form asking for a fee waiver with the I-90. Sometimes, USCIS has mercy on people who have already spent so much money on their application fees ($1070 as the filing fee for form I-485), had their case approved, and then never saw their green card, and they grant a request to waive the fee. $450 is a lot of money for many people. It is worth trying this solution if you do not need to leave the United States for a while. If the fee waiver is approved, USCIS will send you the I-90 receipt notice. If the fee waiver is denied, then you will have to send the check for $450, but at least you tried! You can also ask for the help of your Congressman. The Congressman might accept to help you waive the fee with USCIS. Be aware that if you file the I-90 online, you cannot ask for a fee waiver. You can ask the fee waiver only if you print out the forms I-90 and I-912 and mail them to USCIS. When you file Form I-90, you might want to consider putting a different secure address. If you did not move, but your green card got stolen, it might happen again! Finally, if your card was delivered according to USCIS and USPS, in Part 2 of the I-90 form, check the box 2a “my card has been lost, stolen or destroyed”. You cannot check the part 2b, “my card was issued but never received” because you green card was delivered. You can write a separate statement or explain in the financial hardship section of the I-912 fee waiver form that your card was supposedly delivered, but despite checking your secure mail box often, the card was somehow lost in the mail. As you have an approved green card case, you are officially a permanent resident and you must show a green card when you come back in the US. However, you might have to wait 6 months before USCIS issues you the new green card. Fortunately, you can set up an Infopass appointment with the closest field office to get the I-551 stamp, which is a stamp in your passport confirming your status as a permanent resident. On the day of your appointment, go to the field office with your passport and ask the officer to stamp the “immigrant stamp” in your passport. This stamp will allow you to come back in the US. Finally, if your card was delivered according to the USCIS website, file the I-90 before going to the Infopass to ask for your immigrant stamp. Bring the printed receipt notice of your I-90 submitted online or by mail. The officer will refuse to stamp your passport unless you bring the I-90 receipt notice confirming that you did apply for the new green card. For further questions please contact our office. We would be happy to help you.